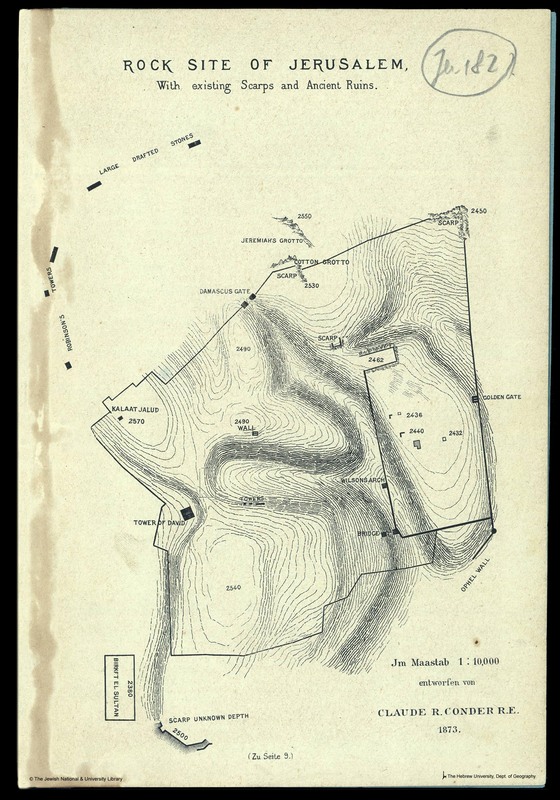 Thanks to The Jewish National & University Library, Shapell Family Digitization Project, Eran Laor Cartographic Collection and The Hebrew University of Jerusalem, Dept. 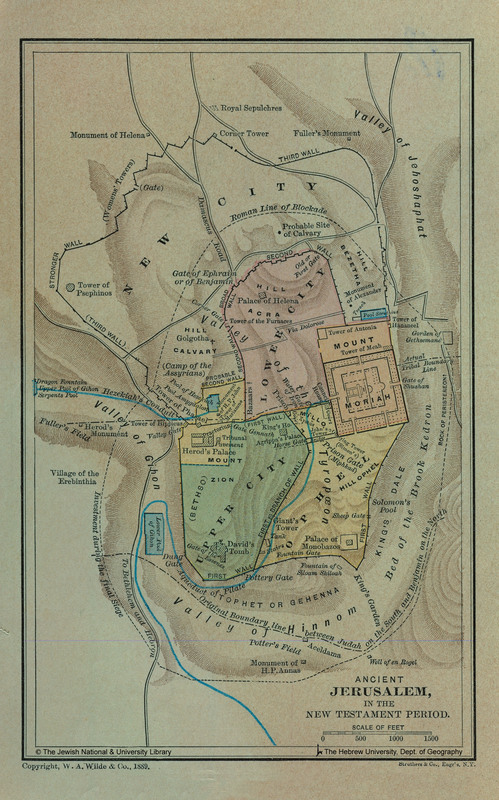 of Geography, Historic Cities Project, for permission to use these images. 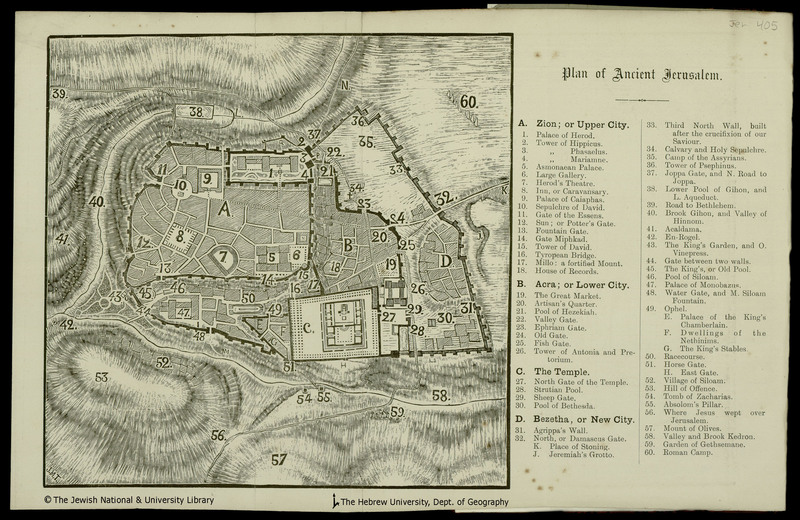 Their website is full of historical maps of Jerusalem if you want to explore more of Jerusalem or create your own overlays. 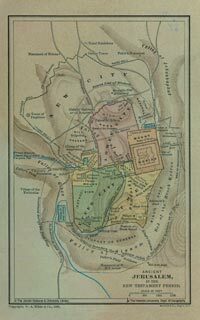 The KML of water bodies in the Bible now includes outlines of nearly all the rivers, lakes, and seas the Bible mentions. Surprisingly, there aren’t that many. 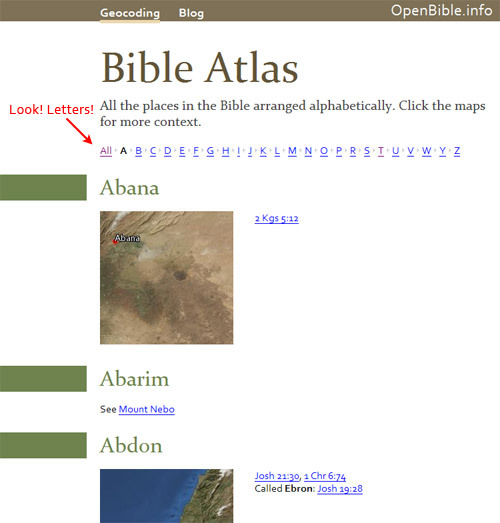 The entries in the Bible atlas now appear on individual alphabetical pages instead of all on one page. (Though the full version is still available.) The many images on the page made it slow to download even on broadband connections. 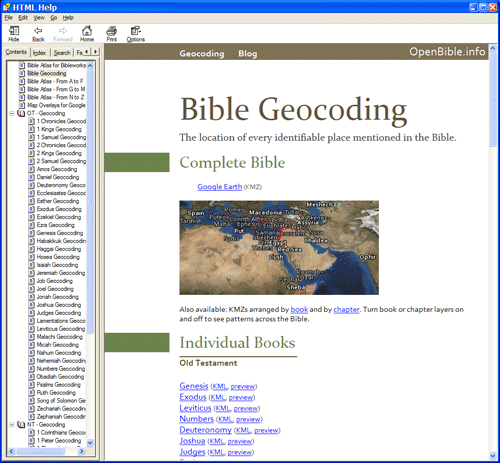 Pasquale on the BibleWorks forum has created a module that lets you browse the maps here directly from BibleWorks (though it helps if you have Google Earth installed). Download the file (35 MB .zip). The forum post has more instructions. BibleWorks accepts regular HTML Help (.chm) files with some supporting metadata, so it looks like Pasquale created a local version of parts of this website. Nifty! You don’t even need BibleWorks to browse the file itself; any recent Windows computer should work fine. The only disadvantage to a local file, of course, is that it can’t include any new corrections that I make on the site. I’m linking to a file hosted here here because the file linked on the forum is split into five pieces, which you have to download separately and reassemble. The above link is a simple .zip file. 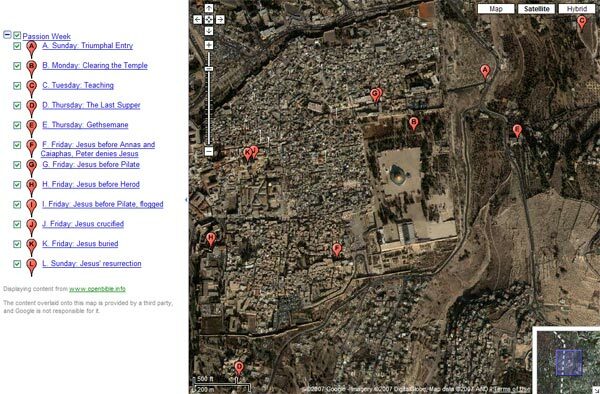 Download a KML of the locations from the Passion Week in Google Earth (or preview it). Passion Week runs from Palm Sunday (Jesus’ triumphal entry into Jerusalem) through Easter Sunday (Jesus’ resurrection). Check out a chronology of Passion Week for more details. Thanks to Catholic Gauze for the idea. In the live application you can move around and highlight different photos taken from all sorts of angles. Check out the screencast if you’re hesitant about installing an ActiveX control on your computer. I can see using this technology to reconstruct highly photographed places like Jerusalem in 3D. It’s not quite as good as building your own virtual-reality model of Jerusalem, but it’s a lot easier. Consider that flickr has about 9200 photos tagged “Jerusalem” under a Creative Commons license, and you can imagine the possibilities. I look forward to being able to upload your own (or others’) photos and have the application create a space for you. Right now you can only use predefined photo collections. 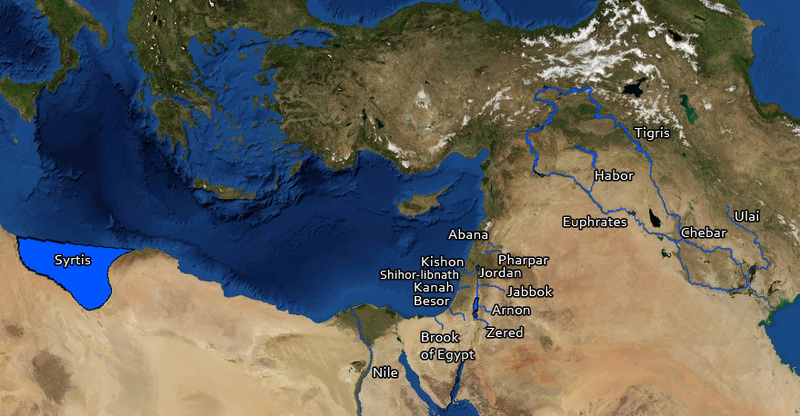 Download a KML with shapes for the Sea of Galilee, the Jordan River, and the Salt (Dead) Sea. The problem with water data is that water levels and paths fluctuate over time. The path in the KML for the Jordan River matches the current satellite data in Google Earth precisely, for example. But the river will change locations the next time Google updates its satellite imagery. And then I’ll either have to update the path to match the new imagery or live with the discrepancy. 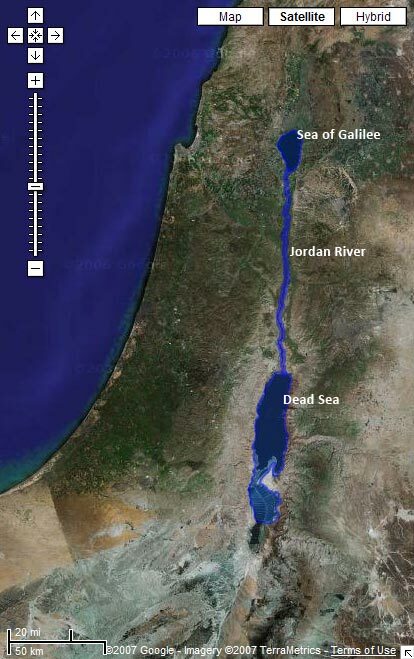 Of course, the current path of the Jordan only approximates the path it took in biblical times. So even if I update the file whenever Google gets new data, it still won’t accurately represent the historical context (which is impossible to reconstruct). Even worse is the Dead Sea, which has dramatically shrunk over the past century as more fresh water gets diverted for human consumption. I tried to reconstruct the boundaries of the Dead Sea as it existed during the Bible, but the result is a disconnect between the satellite imagery and the shape file. I made these outlines by tracing the satellite imagery in Google Earth using the Path and Polygon tools. It’s time-consuming, but you end up with a nice, accurate result. I’m surprised that no one’s done it before for some of these water bodies—at least, not that I could find. I haven’t yet integrated the data with the rest of the KMLs because I’m not sure the best way to go about it. The main problem is that Google Earth doesn’t let you directly label a polygon or a path on the map. So while you can see the outline for the Sea of Galilee, you can’t know that that’s what it is. People often get around this limitation by creating a placemark inside a shape; I may end up doing that. I hope to trace more bodies of water over time; I’ll be sure to blog about it when I do. 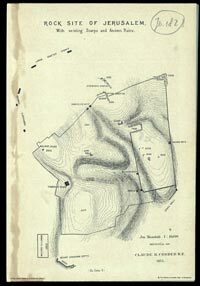 This file represents my first attempts at creating polygons and paths in Google Earth. I wanted to try out some of the features I haven’t used yet. Reducing places to points on a map doesn’t always isn’t always the best way to represent them—some places cover large geographical areas, and shapes are useful in such situations. You are currently browsing the OpenBible.info Blog blog archives for April, 2007.